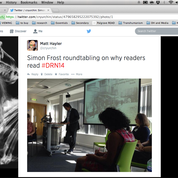 Dr Matthew Freeman is Reader in Multiplatform Media at Bath Spa University. He is Deputy Director of the University-wide Centre for Cultural and Creative Industries, Co-Director of the Centre for Media Research, and leads the University’s Communication, Cultural and Media Studies submission to REF2021. His research examines cultures of production across the borders of media and history, and he is the author/editor of seven books: The World of The Walking Dead (2019), Transmedia Archaeology in Latin America(2018), The Routledge Companion to Transmedia Storytelling(2018), Global Convergence Cultures(2018) Historicising Transmedia Storytelling (2016),Industrial Approaches to Media (2016), and Transmedia Archaeology (2014). He has also published over 30 journal articles and book chapters, is Series Editor for the Routledge Advances in Transmedia Studies book series, and sits on the editorial board of the journal Convergence. He is the co-founder and co-editor of the International Journal of Creative Media Research, a new journal which aims to push forward the potentials for publishing creative and practice-based research. People now engage with media content across multiple platforms, following stories, characters, worlds, brands and other information across a spectrum of media channels.Yet both the biggest challenge and the biggest opportunity for understanding transmediality – itself the use of multiple media technologies to tell stories and communicate information – is the sheer breadth of its interpretation. Though primarily still seen as a commercial practice, this talk explores the application of transmedia practices to the communication of history across multiple media platforms, questioning what this approach means to our understandings of transmediality. More specifically, the talk furthers discussions of the contribution that transmedia storytellingcan make to educational practices, identifying new strategies for how transmediastorytelling is now being used to capture and narrativize historical memories, as media-based educational resources. To do so, the talk focuses on the Colombian armed conflict and the Desarmados project, for which I served as a member of the project team, and for which in this context to theorise how transmediality can work as socially progressive and emotionally supportive form of historiography. Desarmados is an internationally-funded research project which aims to harness commercial ideas about digital platforms and transmedia storytelling as tools for documenting the Colombian citizens of Medellín and for narrativizing their memories of the Colombian armed conflict as an educational resource. A transmedia project supported by the Colombian Ministry of Culture and the Colombia Government, Desarmados seeks to reconstruct the cultural memory of the Colombian armed conflict, and develop workshops with secondary schools in Medellin to help test out new transmedia materials as modes of social enterprise between survivors and civil society. 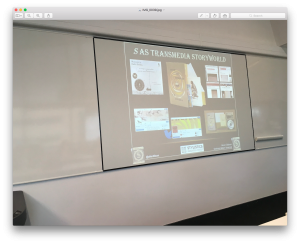 As such, this talk will interrogate not the history of transmedia storytelling, but rather how the working practices of transmedia storytelling can deal with history, creatively and socially. Desarmados, I argue, exemplifies not only a new way of experiencing and remembering Colombian history, but as that which reshapes said Colombian history for the better. 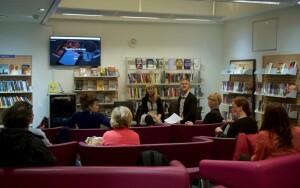 The Arts and Humanities Research Council (AHRC) funded Reading on Screen project held two workshops recently; one at the University of Brighton (22-24 September) and one last weekend (14-15 October) at Sheffield Hallam University. At Sheffield we were fortunate to be included in the programme for Off the Shelf, a literary festival that runs throughout October in the city featuring some high profile authors, including this year Robert Webb and Henry Blofeld. 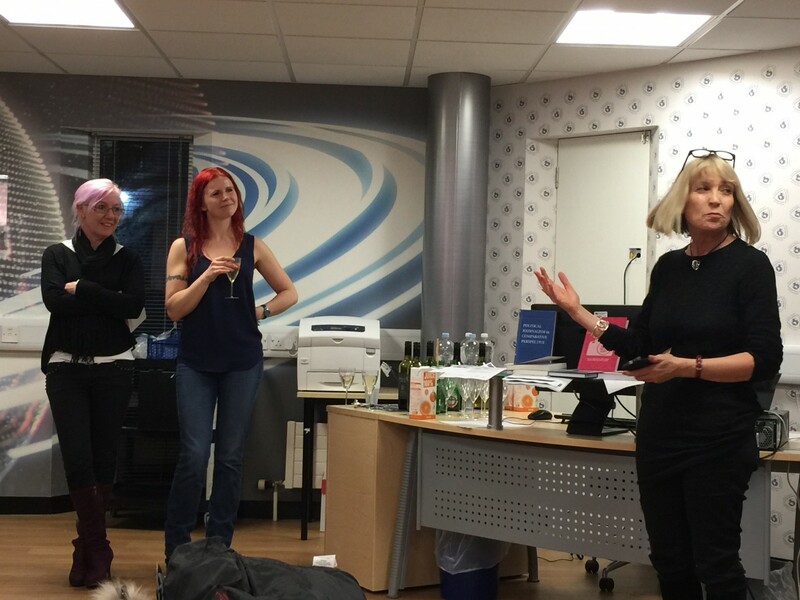 We also took part in Brighton’s Digital Festival, showcasing some of the stories and also featuring some of our storytellers in a lively discussion about the future of reading in the digital age. The stories produced in the workshops are now available for viewing on the project website and we welcome comments! An exhibition of the stories is planned for December 15 in Brighton’s Media Centre. Here we will be featuring the stories we are producing based on photographs and audio recordings captured during the workshops. We will also be hearing from some of the storytellers from all three workshops (Bournemouth, Brighton and Sheffield) about their experiences of the workshops and how this opportunity has opened new doors for them. 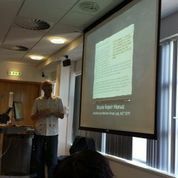 It was my great pleasure to take part last week in a conference organised by the Stylistics Research Group at Sheffield Hallam Style and Response. 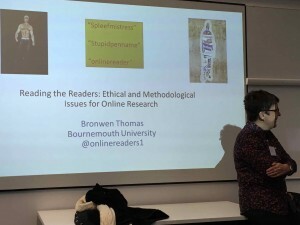 My paper reported on the activities of our two BU based AHRC funded projects, and on the ethical and methodological challenges of researching readers and reading online. The conference was an important opportunity to disseminate the work of the existing projects and to further extend our network of scholars researching reading in the digital age. It was also an opportunity to discuss what will hopefully be the next stage of this research, as our application for Follow on Funding to the AHRC is currently being finalised…. The first day included a fascinating panel on Digital Fiction, particularly focusing on immersion and showcasing different methodologies including the Think Aloud protocol and participant interviews. The case studies discussed in this session included Dreaming Methods’ Wallpaper (Alice Bell), videogame Zero Time Dilemma (Jess Norledge and Richard Finn) and The Princess Murderer (Isabelle Van der Bom). After lunch, I switched between panels to catch Sam Browse’s entertaining paper presenting an ethnographic study of a group of local Labour party activists, followed by Lyle Skains’ paper reporting on how her creative writing students responded to reading digital or ‘ergodic’ fiction, and how they felt this influenced their own creative practice. I delivered the opening plenary on day 2, followed by a fascinating panel on Attention, with an insightful paper on cognitive approaches to re-reading from Chloe Harrison and Louise Nuttall, and a very informative and interesting paper on eyetracking and onomatopoeia in manga from Olivia Dohan. Alison Gibbons’ paper on JJ Abrams’ S offered a fascinating account of the novel as part of a transmedia universe, and reported on her attempts to get ‘real readers’ to create and insert their own marginalia alongside that provided by the novel’s creators. The closing plenary was an energetic and engaging discussion of persuasion and transportation by Melanie Green. As well as transporting us to another world by reading us a story, Melanie’s paper left us with some important insights into the power of stories to change minds for good and ill. Many congratulations to the organisers of this event for producing such a stimulating couple of days. It was wonderful to see that the study of readers and reading is attracting some innovative work from within the field of stylistics, drawing on a long tradition of focusing on the empirical, but also demonstrating breadth of engagement with terms and methods from multiple disciplines. The specific language of different media spaces (mainly, advertising). What I have learnt in these two research stays at BU forms the basis for the research project entitled Lenguaje y medios de comunicación: relaciones interlingüísticas e interculturales ingles-español (Reference: FFI2016-74858-P) (Language and the Mass Media: English-Spanish interlinguistic and intercultural relationships), for which I have applied for funding from the Spanish Ministry for Education and Innovation. Dr. Bronwen Thomas, Associate Professor at BU, will take an important part in the project, if approved and granted, thus helping to establish some institutional links between the University of Bournemouth and the University of Huelva. Apart from the aforementioned research project, I am working at the moment on a scientific paper which analyses Spanish advertising, a particular means of communication almost completely unknown to me before my two stays in Bournemouth. My paper will have a special emphasis on the influence English advertising has – graphically, socially and linguistically. 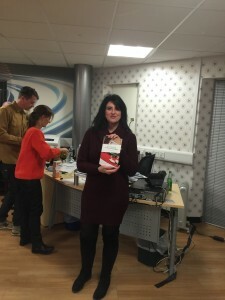 Simon Frost and I recently took part in this event organised by an AHRC project based at The Open University which follows on from previous research leading to the establishment of The Reading Experience Database (RED). The event brought together book historians, literary scholars and researchers working on the borders between literature and media and cultural studies to explore a variety of examples of reading communities from Quaker reading groups and records of readers in the borrowing records of national libraries, to online book clubs and LARPs (Live Action Role Playing events). 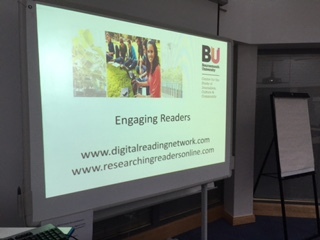 This was a good opportunity for us to promote the work of the BU based Digital Reading Network, and CsJCC, based in the Faculty of Media and Communication. 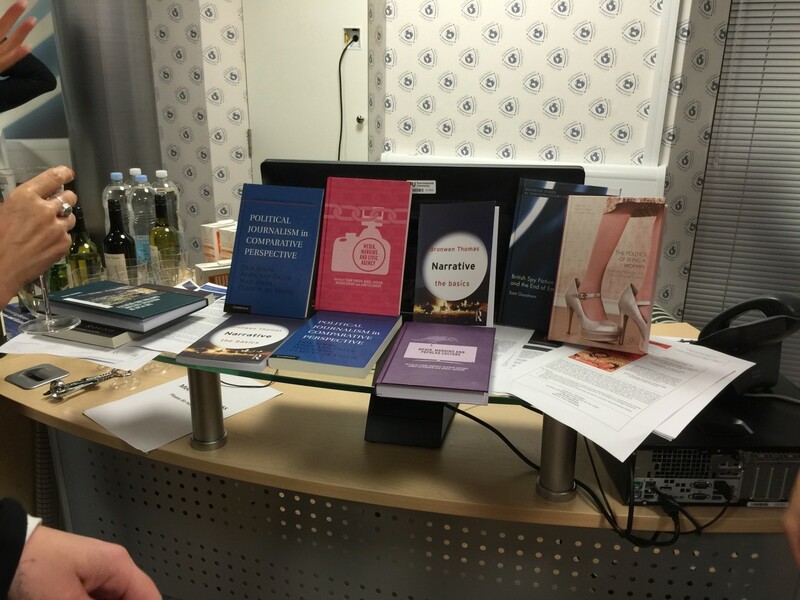 Simon’s paper reported on the findings of his BU Fusion funded project looking at contemporary book retailing, which was conducted in collaboration with the university bookseller John Smith’s. 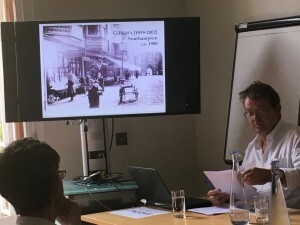 Simon’s paper provided a fascinating comparison of the retail landscape using past and present photographs of the same Southampton street where Gilbert’s bookshop is based. He boldly proposed replacing the term literary work with ‘Net Work’ to capture the idea of the work as an event which consists of people, places and bibliographic objects. The proposal plays into wider global HE strategies to study English for its social impact. My paper provided a comparison of two online reading communities. The first, a Jane Austen community called The Republic of Pemberley, brings together devotees of the writer who engage in scheduled Group Reads of her work, using the website to report back and share their reading with other community members. I also discussed how readers use social media platforms such as Twitter to share their reading, for example using the hashtag #mytolstory as they embarked on reading Tolstoy’s epic novel inspired by the recent BBC adaptation. My paper drew on an article Julia Round and I recently published in the journal Language and Literature on online moderators, which was one of the outputs from our AHRC funded projects, Researching Readers Online and the Digital Reading Network. The day provided an excellent opportunity for us to expand our networks, and establish new contacts. In particular, we were very excited to connect with researchers from the University of Malmo in Sweden whose research and philosophy for teaching English in a media context is closely aligned to our work here at BU. I have just returned from a conference at the University of Malta organised by the EU COST Action on Cyberparks which I am participating in. 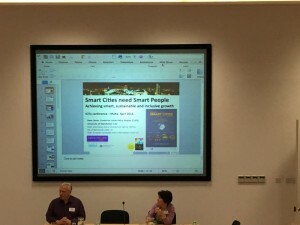 The conference was on the theme of the I-city, enhancing places through technology and featured keynotes reflecting on and critiquing the notion of the ‘Smart City’ from different disciplinary and methodological perspectives and with reference to projects taking place across Europe. Valletta, where the conference took place, is going to the European Capital of Culture in 2018 and one of the presentations was from the Foundation team, offering some interesting insights into how preparations would focus on technologically-driven community regeneration. Discussion in the parallel sessions which followed was organised around three tracks (Digital Methods and Social Practices; Ethnographic challenges; People, spaces and technology) led by COST Action members. 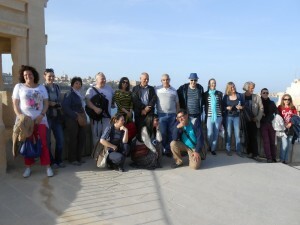 The organisers also organised two field visits for us, looking at how technology is being used for the regeneration of public spaces and historical building in Valletta. Following the conference, I also participated in the working group meetings for the project, where discussion centred on dissemination and networking, and plans for future collaborations between members. This was the second COST Action meeting I have attended so far and it was good to see how the project and collaborations between members are progressing. I have learned a great deal from working alongside colleagues from a diverse range of disciplines and cultures, and hope I will be able to attend the next meeting, which will be in Skopje in Macedonia in October. As well as myself, FMC Visiting Fellow Sue Thomas is also involved in the Cyberparks project and in addition to being a working group member is also on the project’s Editorial Board. On Wednesday 9 December, the Centre for the Study of Journalism, Culture and Community held a book launch to celebrate the work of colleagues who have published monographs or edited collections over recent months. In total we had around 9 books to browse and discuss and it was great to hear of further book projects in development. Books on display included Gothic in Comics and Graphic Novels by Julia Round, British Spy Fiction and the End of Empire by Sam Goodman, The Play of Political Culture, Emotion and Identity by Candida Yates and Narrative: the Basics, by Bronwen Thomas. Edited volumes included Shaun Kimber’s, Snuff: Real Death and Screen Media and Nael Jebril’s Political Journalism in Comparative Perspective. Soon to be published is Chris Pullen’s Straight Girls and Queer Guys, his ninth book so far! Pictured below are Candida Yates, Sam Goodman and Peri Bradley talking about their books. Peri Bradley’s book on Food, Media and Contemporary Culture features contributions from several colleagues in the Faculty of Media and Communication, while Media, Margins and Popular Culture edited by Einar Thorsen, Jenny Alexander, Heather Savigny and Dan Jackson is a collaboration between CsJCC and the Centre for Politics and Media in the Faculty. 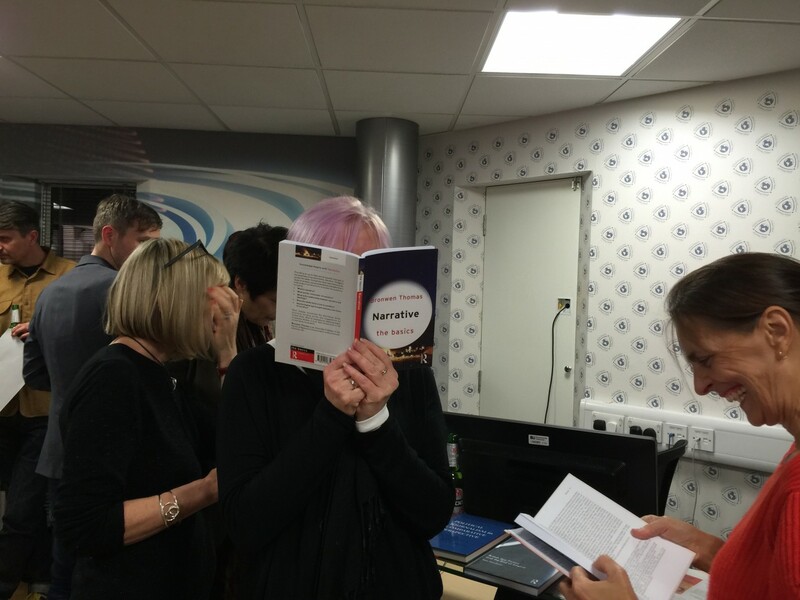 Colleagues attending the event were keen to start reading the volumes on display. 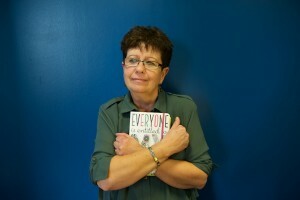 All books will soon be available from the library. The Centre for the Study of Journalism, Culture and Community will be holding a book launch on Wednesday 9 December between 5 and 7 in the Global Hub room (DG68) to celebrate the work of colleagues who have recently had books published. Refreshments will be on offer and all are welcome to drop by. Since the findings in my last publication (Rodríguez Arrizabalaga 2014) have awakened in me, as a linguist, a new interest in the linguistic dimension of the English media, last February I applied for a three-week research visit at the Faculty of Media and Communication (and its Centre for the Study of Journalism, Culture and Community) due to its internationally recognised status in this particular field of study. I have brought to Spain with me a huge number of interesting ideas which are going to constitute the starting point for this new area of research in my academic career, which, as such, still require deeper investigation. There have been, however, too many bibliographic references that I have not had time enough to read which I would like to explore next year, if possible, in anoher research visit which I would like to apply for. Apart from the time I have spent in the library, during my reasearch visit I have have some the opportunity of meeting really nice and interesting people from the Faculty of Media and Communication: Dr. Bronwen Thomas and Dr. Carrie Hodges are two cases in point. With the former I have had several talks about our projects and about the possibility of signing an Erasmus Agreement for Professors and Students between Huelva University and Bournemouth University; and with the latter I hope to co-work in the near future because our teaching and research interests are quite closely related. I really appreciate their time and their kindness with me. To finish, I would also like to thank the administrative work carried out by Jan Lewis, without which my research visit would not have been possible. The final talk hosted by the Narrative Research Group this semester will take place tomorrow at 4p.m. in PG10. Our speaker is Dr Tim Hutchings from Durham University. Dr Hutchings is a sociologist and ethnographer of digital religion. His PhD (Durham University, 2010) examined the relationship between online and local activity in five online Christian churches, looking at emerging patterns of ritual, community and authority. His subsequent research has included studies of online Christian proselytism and storytelling (HUMlab, Umea University, Sweden), digital Bible reading (CRESC, The Open University) and contemporary pilgrimage (CODEC, Durham University). A list of his publications can be found here: https://durham.academia.edu/TimHutchings. Dr Hutchings is the Editor of the Journal of Religion, Media and Digital Culture and Conference and Events Officer for the British Sociological Association’s Sociology of Religion Study Group. His talk will focus on Bible apps and the impact of digital reading on religious authority. All welcome. 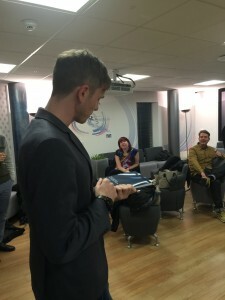 On 29 October in The Octagon, an AHRC funded workshop brought together international scholars researching digital reading with teachers and students from the locality to discuss what use might be made of digital reading and social media tools in the classroom. In the opening paper, Joachim Vlieghe and Geert Vandermeersche from the University of Ghent outlined the ways in which the emergence of new platforms and digital tools is offering new opportunities for readers to engage with texts, other readers and authors. They reported on a study they conducted with trainee teachers using Goodreads, a popular book recommendation site with over 30 million members. This research has recently been published in the journal New Media and Society, and offers valuable insights into the potential pedagogical uses of such sites, while also recognising the strong misgivings teachers have about the kind of discussions and interactions that take place in such seemingly free environments. In the discussion that followed, teachers from local schools and colleges commented that while they found such resources interesting and potentially valuable, the demands of delivering targets and rigidly teaching to the curriculum meant that in reality they had little time to explore or incorporate them into their classes. 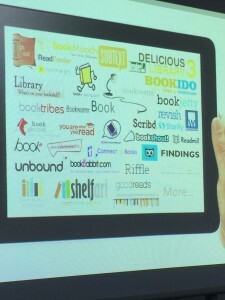 The discussion also focused on how sites such as Goodreads come and go, or are bought out and commercialised by large corporations (Goodreads is now owned by Amazon), and how they might in fact mimic rather than offer an alternative to the ways in which literature is taught in the classroom. Also receiving support from the AHRC through the Digital Transformations call, Bronwen Thomas and Julia Round reported on the first of their projects to be funded, Researching Readers Online. This project involved an online survey of users of book-related online forums, and focus groups with students, local writers, librarians and members of local reading groups. 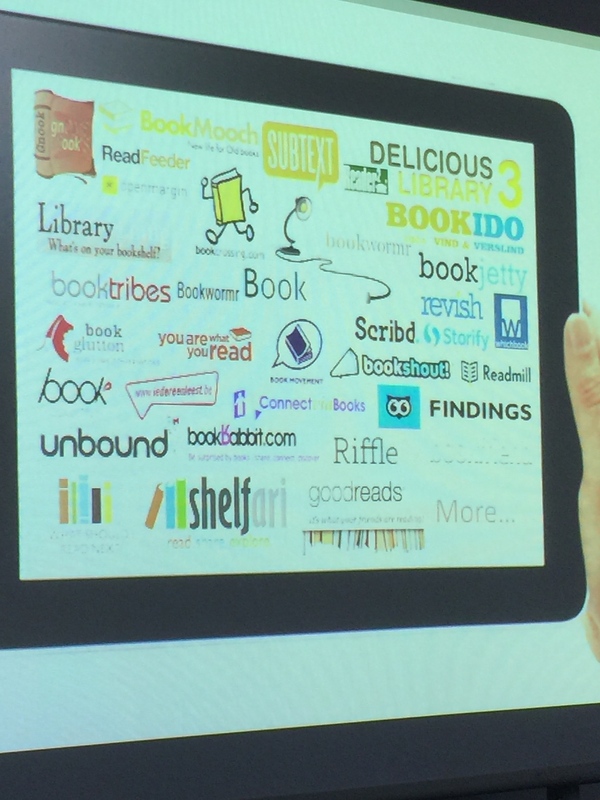 The project was in part motivated by the desire to explore how teachers of literature might learn from the kinds of discussion and engagement taking place online, but the findings in fact challenged many existing preconceptions about ‘digital natives’ and their reading habits and preferences. 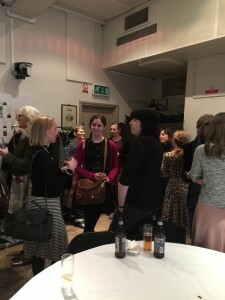 This was the penultimate event organised by Julia and Bronwen as part of their latest AHRC award, supporting the establishment of an international Digital Reading Network. Previous events included a symposium held at BU in June 2014. The final event will take place in early 2015 in London, bringing together publishers, writers, charities and public sector organisations to discuss the issues raised by research in this area. 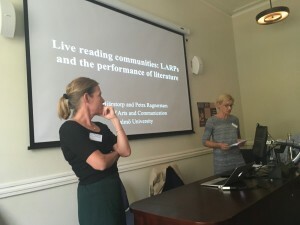 The AHRC funded Digital Reading Network, led by BU academics Bronwen Thomas and Julia Round, held its first symposium at the EBC in June. The event attracted speakers and participants from countries including the US, Sweden, Norway and Mexico, and brought together academics professionals and practitioners for a stimulating and enjoyable day. The first panel of the day focused on ereaders, with papers exploring the phenomenon of used ebooks (Simon Rowberry, University of Winchester) and comparing the reading of ebooks with print texts in Norway (Anne Mangen, Stavanger Univeristy) and Sweden (Torsten Petterson, University of Uppsala). Anne Mangen also spoke about the EU COST ACTION, E-READ, which she is currently leading, and which features members of the Network. 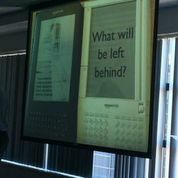 The main theme of the event was social reading, and keynote Bob Stein showcased his pioneering digital publishing initiatives including SocialBook which allows readers to interact with one another while reading the same text in real time. A lively roundtable on social reading brought the day to a close and featured contributions from leading academics researching the history of reading, book clubs and events. The day also featured hands-on workshops on data analysis, led by Anouk Lang from the University of Strathclyde, and digital wellbeing, led by BU Visiting Fellow Sue Thomas. 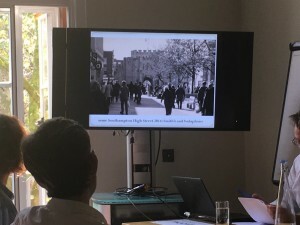 Beth Williamson (University of the Arts) and Dan Goodbrey (University of Hertfordshire) offered fascinating insights into how digitisation can be used to enhance multimodal texts, with papers on artists’ books and sound in digital comics. Bronwen Thomas and Julia Round presented a paper based on their work exploring online reading communities, featuring interviews with forum moderators, while Marianne Martens (Kent State University) focused on the laws and guidelines affecting websites targeted at young readers in the USA. 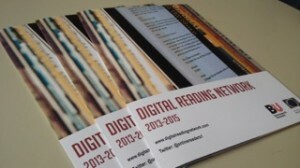 The Digital Reading Network continues to attract interest and new members from around the world. The next event will be held here at BU in October, and the project continues until March 2015. Further details including some of the papers delivered at the symposium can be found on the project website www.digitalreadingnetwork.com. 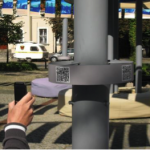 The EU COST funded CyberPark project brings together participants from 21 countries to explore how ICT can help attract more users to engage with public spaces more efficiently, enhancing their health and wellbeing. With the emergence of social media, wearable technologies and devices such as Google Glass, a future where technology is embedded in the environment and where landscapes respond to the people who pass through them may no longer be just science fiction fantasy. The CyberPark project will explore how nature and the digital can be brought closer together, drawing on the expertise of urban planners, architects, anthropologists and researchers from the arts and humanities. Bronwen Thomas, Sue Thomas and Sam Goodman from the Media School’s Centre for the Study of Journalism, Culture and Community will all be contributing to the four-year project from May 2014. Bronwen Thomas is Director of the Centre and an Associate Professor in the Media School. She has published widely on new media narratives and organized the Location-based Storytelling symposium here at BU in 2012. Sue Thomas is a Visiting Fellow in the Media School, and recently published a book on Technobiophilia (Bloomsbury, 2013) exploring the relationship between nature and cyberspace. She is currently developing ideas around digital well-being. Sam Goodman is Lecturer in Linguistics in the Media School, with research interests in Medical Humanities and literary representations of space, place and landscape. The AHRC-funded Digital Reading Network will be hosting its first symposium on 19 June. The event will take place in the Executive Business Centre at Bournemouth University. All are welcome to attend this free event but please note that places are limited. Bob Stein, a pioneer of electronic publishing and founder of the Institute for the Future of the Book, will be our keynote speaker. Bob will be discussing his latest venture, SocialBook, a new digital publishing platform which promises to take the idea of social reading to a new level. The day will feature contributions from international scholars and practitioners drawing on a wide range of approaches and methods in an attempt to understand the momentous changes affecting readers and reading in the digital age. As well as scholarly papers, the day will include workshops, roundtable discussions, exhibitions and poster presentations. Lunch and refreshments will be provided. Further details of the programme and travel and accommodation information are available on the DRN website (www.digitalreadingnetwork.com). To register your place, please contact srose@bournemouth.ac.uk. The next in the series of Narrative Research Group talks will take place on Wednesday 26 February at 4 p.m in CAG06. Paul Williams, Lecturer in Twentieth-Century Literature at the University of Exeter, will examine the ways in which ‘the novel’ was used in the 1970s to conceptualise ambitious comic projects. 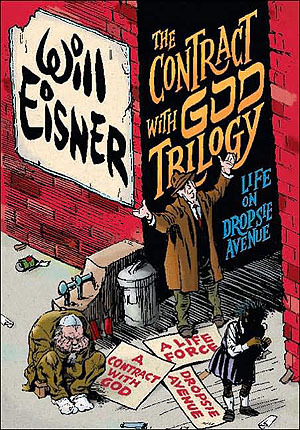 Although Will Eisner’s A Contract with God (1978) is frequently hailed as the threshold text popularising the ‘graphic novel’, it was one of several projects whereby comics were published in book form for adult readers in the 1970s. The talk will establish the different modes of production open to creators aiming for long, complete narratives. By outlining the main publication routes available at the time, we can start to explain why 1978 saw an exponential growth in book-bound comics for adult readers, before numbers dropped in 1979 and 1980. Paul Williams is Lecturer in Twentieth-Century Literature at the University of Exeter, where he has been working since 2008. He has written on a wide range of genres, texts and media, including Cold War literature, Vietnam War films, hip-hop music and 1970s psychotherapy; his main publications are The Rise of the American Comics Artist (2010; co-edited with James Lyons), Race, Ethnicity and Nuclear War (2011) and Paul Gilroy (2012). We are delighted to announce that Professor Emma Griffin from the University of East Anglia will be presenting a paper to the Media School’s Narrative Research Group as part of this semester’s series of talks. The title of Emma’s paper is ‘Victorian Mothers: perspectives from working-class autobiography’, and the full abstract for Emma’s talk appears below. The event will take place at 4p.m on 5 Feb in the Casterbridge suite. All welcome. Historians like to imagine that emotions such as maternal love are largely constant across time and space. They argue that mothers in earlier times loved their children in much the same way as we do today, though they accept that love was often expressed in different ways. This paper turns to working-class autobiography to consider these claims. It asks how the emotional ties of family life were expressed and sustained in households where space and resources were scarce. It concludes that material deprivation had the power to undermine family relationships in ways that historians have usually been reluctant to admit. 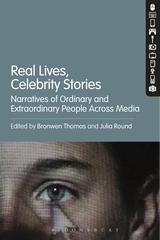 To celebrate the publication of Real Lives, Celebrity Stories, edited by Bronwen Thomas and Julia Round, the Media School’s Narrative Research Group will host a book launch at 3 p.m on 29 January in the Casterbridge suite. 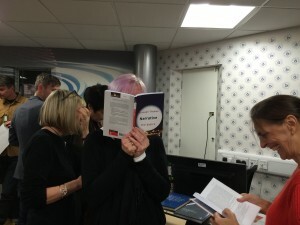 Featuring contributions by several colleagues from the Media School, including Shaun Kimber, Peri Bradley, Darren Lilleker and Sue Thomas, the book was inspired by the first symposium organised by NRG back in 2010 and explores narratives of ordinary and extraordinary people in television, film, fan cultures, comics, politics and cyberspace. 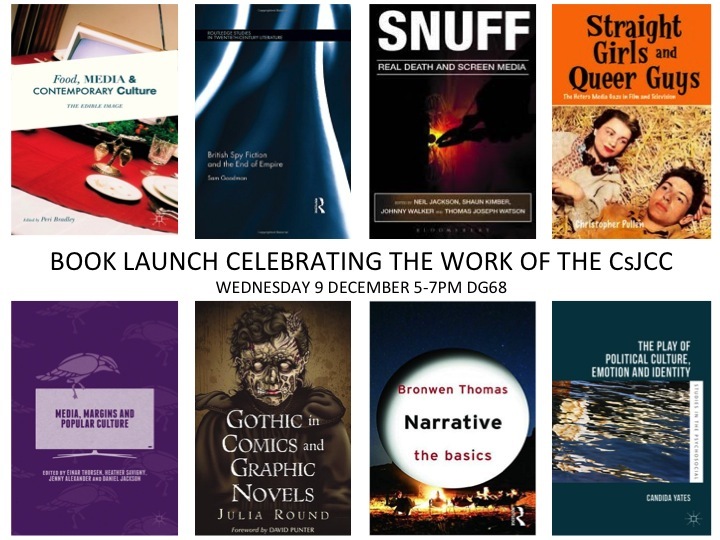 At the launch, the editors and contributors will provide a brief introduction to each of their chapters, and light refreshments and wine will be provided. All welcome.